About "NKJV Children's Ministry Resource"
WHETHER YOURE A PARENT, SUNDAY SCHOOL TEACHER, SCRIPTURE TEACHER OR CHILDRENS WORKER, THIS COMPREHENSIVE, ALL-IN-ONE RESOURCE WILL HELP YOU TEACH THE BIBLE TO 5-12 YEAR-OLDS IN AN ENJOYABLE WAY, AS YOU LEAD THEM INTO A VITAL RELATIONSHIP WITH GOD. A WEALTH OF HELPS FROM THE CHILD EVANGELISM FELLOWSHIP ARE PROVIDED, INCLUDING TWO YEARS OF EXCELLENT READY-TO-USE LESSON PLANS. FROM NELSON.A DYNAMIC NEW TOOL FOR TEACHING GODS WORD TO CHILDREN!THE CHILDRENS MINISTRY RESOURCE BIBLEPHOTOGRAPH COVER ONLYWhether youre a parent, Sunday school teacher, Scripture teacher or childrens worker, this comprehensive, all-in-one resource will help you present the Bible to 5-12 year-olds in a simple, enjoyable way, as you lead them into a vital relationship with God.The clear, modern English of the New King James Version has been combined with a wealth of handy helps from the Child Evangelism Fellowship, including: Two years of excellent ready-to-use lesson plans. Simple, practical guidelines to help you explain difficult Bible passages to children. Maps, charts and articles offering insight into Bible life, lands, people and events. Self-help skills to help teachers improve all aspects of their lessons. Plus, thousands of footnotes that clarify important terms, phrases and ideas; a concordance; a pronunciation dictionary; centre-column references; and a subject index.With the Childrens Ministry Resource Bible, youll be better prepared than ever before to present the power of Scripture and the message of salvation to young children in a way they will understand and enjoy. From Nelson. No need to reinvent the wheel. "The Children's Ministry Resource Bible, developed in conjunction with "Child Evangelism Fellowship, is filled with almost endless options for Bible study with children whether at home, school, or Sunday school.^Fully developed lesson outlines make planning easy, while sidebar and footnote information let you take the lessons as deep as you want to go.Full-page articles and pronunciation dictionary complement the lessons.Comes complete with a special teacher training section and the Wordless Book, a colorful way to share the gospel message. 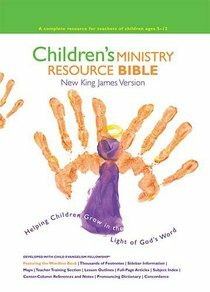 "The Children's Ministry Resource Bible provides just what you need to lead children ages five to twelve into a vital relationship with God. Fully developed lesson outlines ^ Full-page articles ^ Teacher training session ^ Sidebars and footnotes ^ Pronunciation dictionary ^ 1,880 pp.